After the death of their parents, Camille is left alone to take care of her sister, whose health is suffering, and ward off her brother, whose vices have become a danger to them all. Life in 18th century Paris is not easy for the likes of Camille and her siblings and tensions between the rich and the poor have never been greater, but Camille has a rare talent. She is a magician. She uses her magic to turn discarded pieces of metal into coins, the spell holding just long enough for her to spend them and get away before the spell breaks and her trick is found out. Camille's fake coins keep herself and her sister alive, but when her brother's gambling leads him into deeper and deeper trouble, Camille turns to a darker, far more difficult kind of magic to keep them safe. By day she is herself but at night she becomes the Baroness de la Fontaine, a regular at the court of Louis XVI, where Camille intends to use her magic in the gambling rooms to win enough money so she can move herself and her sister to safety. Camille has no love for the aristocrats of Versailles, and she soon finds out that it is a dangerous place to be a magician. Then, of course, back in Camille's real life, where she sheds the disguise of the Baroness de la Fontaine, there is a boy with a hot air balloon, who sees her for who she really is. It's not long before Camille's two lives begin to collide and Camille discovers that she is far from the only person hiding a secret at court. In this reviewer's opinion, this novel has everything. The historical Parisian setting, the civil unrest, a charming inventor with a hot air balloon, the original court of frivolous socialites, palace intrigue, and more than a dash of magic. It's the perfect blend for a dazzlingly fun historical fantasy story but there is plenty of darkness too and Trelease combines the fear and the fun as effortlessly as she does the historical with the fantasy. Far more effortlessly than Camille combines her two opposing lives. In Camille's real life she faces the everyday hardships that led to the French revolution, and she despises the wealthy aristocrats who caused her late father to lose his printing business, but in her life as the Baroness de la Fontaine she begins to befriend some of those aristocrats, and to grapple with the fact that she enjoys their company far more than she ever would have expected. Camille's story may be filled with magic, but her problems are very human, and it is impossible not to feel for her and her sister, and the friends Camille makes, who face not only a revolution that will change their way of life forever, but a scheme many of them aren't even aware they're a part of. 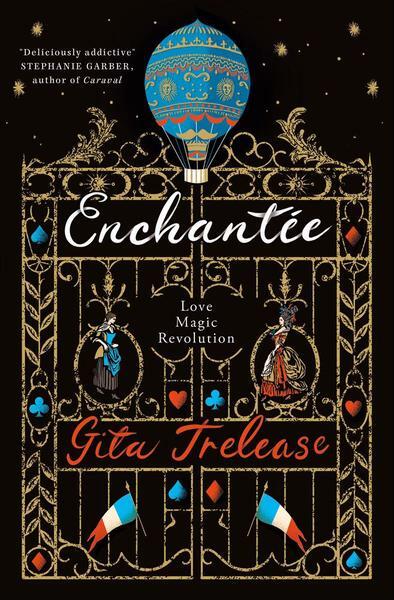 Enchantée is an intoxicating read, every page full of magic and intrigue enough to keep the reader glued to the story until the very end. It's fast paced, exciting, and full of adventure. Trelease's writing makes it impossible to not feel a little swept away, if not by the glittering court of Versailles, then certainly by the dashing Lazare and his hot air balloon. An ARC of this book was provided by the publisher via NetGalley for review. All opinions expressed are the reviewer's own.